Question 51.A, B and C can work together for Rs. 550/- A and B together are to do 7/11 of the work. The share of C should be? Question 52.In Δ ABC, the height CD intersects AB at D. The midpoints of AB and BC are P and Q respectively. If AD = 8 cm and CD = 6 cm, then the length of PQ is? Question 53.The price of a chair is Rs. 500. It has been sold at two successive discounts of 10% each. What is its selling price? Question 54.The percent profit made when an article is sold for Rs. 78 is twice as much as when it is sold for Rs. 69, the cost price of the article is? Question 55.In a Village Panchayat society, 574 names are enlisted as 'below poverty level'. If 14% of the villagers are below poverty level, the total number of villagers is? Question 56.A train 240 meters in length crosses a telegraph post in 16 seconds. The speed of the train is? Question 59.From an external point, two tangents to a circle are drawn. The chord passing through the points of contact subtends an angle72° at the centre. The angle between the tangents is? Question 60.The length of three line segments is given. Is construction of a triangle possible with the segments in the given cases? Question 70.If 2y cosθ = x sinθ and 2x secθ - y cosecθ = 3 then what is the value of x2 + 4y2 ? Question 71.The difference between compound interest and simple interest on an amount of Rs. 15,000 for 2 years is Rs. 96. The rate of interest per annum is? Question 74.In the given Pie-chart, the comparative study of the production of Rice, Wheat, Sugar and Tea of a country is given. Study the Pie-Chart and answer the following questions. 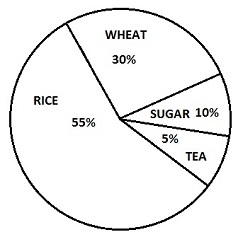 Question 75.In the given Pie-chart, the comparative study of the production of Rice, Wheat, Sugar and Tea of a country is given. Study the Pie-Chart and answer the following questions. He was(A) / very kind enough (B) / to invite me (C) / No Error(D). She __________ him angrily because he made the floor dirty with his muddy shoes. Some languages are used by a few people. Others, such as Mandarin Chinese and English, are spoken by millions. Many people speak two or more languages. They may use one language at home with family and friends, and another at work or school. Regional variations of language are known as dialects. The Anglo-Saxons, who conquered Britain at the end of the Roman Empire, spoke a Germanic language, which later became English. Other Germanic languages include Danish, Dutch, German and Swedish. English also contains French-derived words after it was ruled by French-speaking kings following the Norman Conquest. Mandarin Chinese is spoken by ________people. ________ is part of a Germanic language.